THE SHIVA TEMPLE AT MAHAKUTA THE SHIVA TEMPLE AT MAHAKUTA - Shiva Maha Purana, Vishnu Purana, garuda purana, bhavishya purana, skanda purana. The period starting from the 5th century till the 8th century A.D., witnessed a brisk temple building activity around Aihole, Badami and Pattadakal – all in the Bijapur district of Karnataka. The movement initiated several significant forms of temples, which later developed into characteristic Nagara and Dravidian styles. Of the temples around Badami, the Shiva temple at Mahakuta is of importance for its art and architecture as providing early prototype of characteristic South Indian ‘vimana’, consisting of an octagonal domicil finial supported by a super-imposed series of small shrines. Mahakuta, a small village, is situated in the picturesque secluded glade at the foot of the eastern slope of the two hillocks near Badami. It was an old centre of Shaivites as well as Shaktas, and was popularly known as ‘Dakshina Kashi’. According to puranic legend, this is supposed to be the place of destruction of the two demon brothers, Vatapi and Ilvala, by sage Agastya. It is believed that the two large hillocks are the remains of these demons. Near the village is a group of temples enclosed by a wall. Most of these are Shiva temples, some built in Nagara style, and others in Dravidian style. The larget and principal one at the entrance is dedicated to Mahakuta or Mahakuteshwara. The temple is of the early type and stands facing east. It consists of ‘Ardha Mandapa’, ‘Mukha Mandapa’ and ‘Garbhagriha’ with a ‘vimana’ and ‘kalasha’ of the Dravidian type. A beautiful ‘linga’ is installed in the shrine, and is under regular worship. On either side of the entrance to the enclosure is a Dwarapalaka, of Shaiva type, of the fearful appearance resembling Bhairava and Chamunda. The porch with four square pillars is almost devoid of any decoration. The outer walls of the temple bear a number of pieces of art executed by sculptors of the Early Chalukyan times. Noteworthy among them are Ardhnareershwara, Varaha rescuing Prithvi, and a few guardian deities. There are also pierced windows characteristic of the Chalukyan temples. The Nandi here is very prominent with long garlands of carved bells and looks very beautiful. A sand- stone pillar made to celebrate the righteous victory was found here with long inscriptions describing the wealth and glory of the deity Mahakuteshwara. There are a number of inscriptions carved on the pillars inside the temple. One of them records a gift of certain ornaments of gold, a silver umbrella and some lands to the temple by Vinapoti, a concubine of the Chalukyan king Vijayaditya. Another inscription confirms the grant of lands around Aihole and Pattadakal to Mukteshwara by the Chalukyan king Mangalesha. On architectural grounds, the temple is assigned to the period before 690 A.D. The centre of the temple enclosure has a large masonry tank known an Vishnu Pushkarini. A constant stream of water passes through this tank from a mountain spring, and overflows into the adjoining gardens. 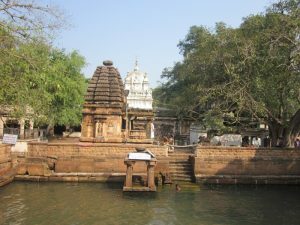 In a little pavilion standing in the middle of the ‘pushkarini’, is a ‘linga’ with five faces upon it, known as ‘Pancha-mukha Linga’. A car festival followed by a big fair is held annually during Maha Shivaratri, when a large number of devotees and tourists assemble at this place. The fair lasts for a period of ten days. Mahakuta can be reached easily by a metoral road from Badami. Local conveyance is always available at Badami to visit this place. A rest house, a tourist lodge and an inspection bungalow are available at Badami town for the use of visitors.